We are pleased to announce and to invite you to attend the 14th Conference on Current Trends in Computational Chemistry (CCTCC). 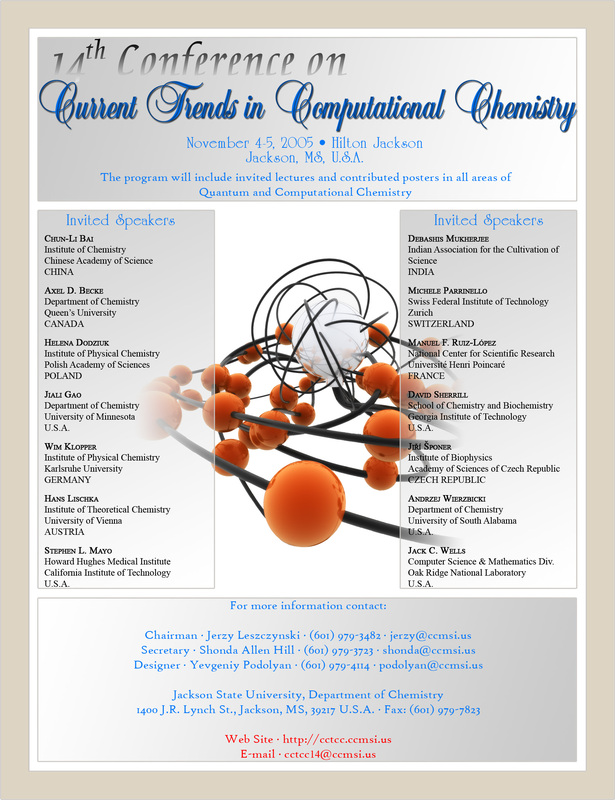 This symposium, organized by Jackson State University, covers all areas of computational chemistry as well as quantum chemistry. 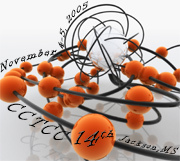 This year the 14th CCTCC will be held at the Hilton Jackson Hotel, Jackson, Mississippi on November 4–5, 2005. A banquet is scheduled for the Saturday evening and a dinner and reception for Friday. The format consists of a series of (invited) plenary lectures and poster presentations on Friday and Saturday covering applications as well as theory. As suggested by Professor Pople, several years ago we inaugurated a new tradition for the second decade of our conferences. Starting with the 11th CCTCC each meeting is featuring a talk named after eminent computational chemists. This year the third presentation in this series will be given by Dr. Michele Parrinello from the Swiss Federal Institute of Technology Zurich. The 14th Conference will also feature another talk given in the ancillary Noble Lecture Series. The lectures in this series are presented in a relaxed, after-dinner atmosphere by the noble speakers and are devoted to noble scientific events and people. As such, it is an exceptional lecture to the conference and, contrary to the regular talks, might not necessarily report any Current findings. As usual, Parallel Quantum Solutions will award monetary prizes to the three best student posters. If you are using Internet Explorer, when you click the flyer, it may be automatically resized. To expand, hold you mouse pointer over the image for 2 sec and then click on the bottom-right square that will appear. Copyright © 2005 CCMSI, All rights reserved.